an announcement from a Forum Helper? 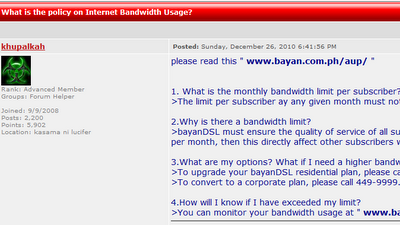 According to Yugatech, from the official forums of bayandsl , a bandwidth cap has been imposed on bayanDSL subscribers (which includes me). I've been seeing several posts already from different blogs about other ISP's issuing bandwidth cap (and I dont even mind) but now, although yugatech mentioned about it not yet being appended on the Acceptable Usage Policy page , I still somehow got alarmed cause I'm not sure if the cap is not sufficient on my internet needs. I'm also sharing my internet with 2 laptops here at home , and 1 laptop from a neighbor. We also have lan party/internet party on few weekends. If i'm still on the stage on downloading movies (which was few months ago), I think I'll be hogging that 100gb cap in no time, specially with my bittorrent client running 24/7.